Labs are posted below -- prelabs are made available on Friday, full labs on Monday. Lab helper information is available below. This course builds upon the principles introduced in CSCI 150 and provides a general background for further study in Computer Science. The course will cover object-oriented programming concepts; the design and implementation of data structures (linked lists, stacks, queues, trees, heaps, hash tables, and graphs) and related algorithmic techniques (searching, sorting, recursion); and algorithm analysis. Students will be expected to complete a number of programming projects illustrating the concepts presented. You can use the 3rd edition if you want, but you might want to cross-check the readings. A copy should be on reserve in the library. The Java Tutorial from Sun. The distribution might be adjusted based on the progression of the course. The actual breakdown of points will depend on the individual project, but the plurality of points will be for the data structure implementation. Projects will also be graded on style, documentation, and test cases. If a portion of your program is not working correctly, please clearly indicate it in the comments at the beginning of the file and in the methods that are not working. Problems that I discover are graded more severely than those you discover. * give additional information in JavaDoc. 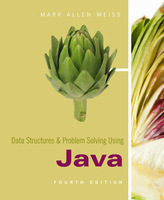 More information on Java style can be found on Sun's Code Conventions web page. There is also an open source tool checkstyle that can be used to check the style used. Regular class and lab attendance and participation is expected. Please talk to me if regular class attendance is going to be a problem. There will be a number of assignments made in this class. I expect every student to attempt each assignment and turn in the results. You are encouraged to complete every assignment as this is one of the most effective ways to learn the material. If you know that for some reason you will not be able to submit the assignment before the deadline, you should contact me in advance of the deadline. Extensions are only granted in exceptional circumstances, but need to be done in advance. Late submissions of lab assignments will be penalized up to 50% per day after the deadline. No late prelabs will be accepted. You will be allowed 1 late day in each half of the semester and 1 late day that can be used whenever (total of 3). You must include the fact that you are using one of your late days in the README document for an assignment. If you have a disability that might impact your performance in this course, or requires special accommodation, please contact me as soon as possible so that appropriate arrangements can be made. Support is available through Student Academic Services, specifically Jane Boomer. You will need to contact them to get your disability documented before accommodations can be made. Quizzes and exams will be closed book, closed notes, and no communication between students. This includes discussing the same to students who are taking a quiz/exam at another time. Discussion of assignments is expected and encouraged, however all work and code on assignments should be your own without outside assistance. Sources should be cited including the textbook and other web sites when you use them in your work. You are not permitted to share your source code with other students, including future ones. You are not permitted to use other students solutions as your own (even those from a prior semester), nor answer keys, nor instructor versions. Confirming that we had and exam is OK, telling another student in the class who has not taken it that it was easy/hard, what topics, etc. is NOT OK.
On a project or homework, discussing what needs to be done and how it can be done is OK, having a student (other than a TA) go over your code is NOT OK, discussing what might be wrong and how to tell is OK (and encouraged). Other than your partner on a given assignment, it is NOT OK to give a student a copy of your code or for them to give you a copy of theirs. As a rule of thumb when discussing the assignments, you should not be writing finished solutions out, and you should be able to independently recreate the material on your own. "I have adhered to the Honor Code in this assignment." Electronic submissions should include the honor statement in either the README file or header comments and must include your name. Contact me if you are interested in a Student Academic Services approved tutor. The CSMC might hold walk-in tutoring sessions as well. The CS department will be hiring a couple of students to work as lab helpers. They will be in the upstairs lab during the hours posted below. The most up-to-date list can be found here.